A scientist at the Harvard-Smithsonian Center for Astrophysics (CfA) is leading an effort to design an instrument that would be the first to come directly into contact with the suns fiery atmosphere after the device is launched on a NASA probe in 2018. Justin Kasper, a solar scientist at the CfA and a lecturer on astronomy, heads a team designing two instruments that will fly aboard NASA's Solar Probe Plus as part of a project to investigate the nature of the sun's atmosphere, or corona. The car-sized spacecraft will carry instruments for four projects three times closer to the sun than any previous spacecraft. After launch, Solar Probe Plus will use a series of close encounters with Venus to put on the brakes and slow before it passes into the sun's atmosphere. The craft will pass within 4 million miles of the suns surface to an area of the corona thought to have temperatures of up to several million degrees Celsius. At that distance, the sun will be 520 times brighter than on Earth, and 20 times larger in the sky. Because of such high temperatures, the craft will be heavily shielded from heat, using a high-tech, carbon-composite heat shield. The front of the shield will bear the brunt of the sun's heat, rising to 2,000 degrees Celsius but leaving the shadows behind the shield significantly cooler, Kasper said. The project, Solar Wind Electrons Alphas and Protons (SWEAP), is backed by a consortium of institutions, including the CfA, NASA, the University of California, Berkeley, Massachusetts Institute of Technology, the University of Alabama Huntsville, and Los Alamos National Laboratory. Though SWEAP has been selected for the mission, several rounds of planning, approvals and refinement remain before construction can begin in earnest, Kasper said. In addition to NASA approvals, the organizers will have to coordinate with the team from Johns Hopkins Universitys Applied Physics Laboratory that is in charge of the overall craft to make sure everything fits properly. Kasper, who was recently named to Popular Science magazines Brilliant 10 list and in September received a Presidential Early Career Award for Scientists and Engineers, said he also works with French researchers who have a solar furnace that focuses the suns rays to very high temperatures and that can be used to heat-test instrument components. Flying a mission to the sun has long been considered, Kasper said, but it has only been recently that technology has advanced enough for it to be possible. Kaspers first thought when he heard of the mission was that if it was going that close, despite the intense heat, it ought to get some direct measurements of the solar atmosphere. The result is the solar probe cup, a rugged instrument crisscrossed with metallic grids that can measure charged particles. Made of heat-resistant tungsten, the device is an often-used design called a Faraday cup, which has flown on many missions to measure charged particles in space, Kasper said. The second instrument is made up of twin solar probe analyzers, which will look ahead and behind the spacecraft, recording particles that strike it. Together, the instruments aim to measure the properties of particles in the solar wind and the suns atmosphere, hopefully answering the question of why the suns atmosphere  unlike the Earths, which cools the further you get from the planet  is hundreds of times hotter than the suns surface. The solar wind is the stream of charged particles that flow from the sun out into the solar system. Within 100 kilometers of the visible surface of the sun, temperatures jump by an order of magnitude. When you get up into the solar corona, temperatures are 1 million to 10 million degrees, Kasper said. 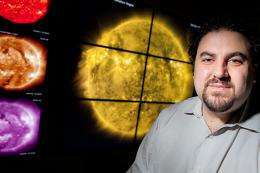 Existing theories focus on the suns enormous magnetic field, Kasper said. Some scientists think that the magnetic field lines, which loop from the sun into space and back again, are shaken by the extreme turbulence of the suns surface and that this shaking generates enormous amounts of energy that heats the atmosphere. Others think the loops actually detach explosively and send streams of energy into space, while still others focus on what happens when those loops reconnect with the suns surface. Were pretty confident that the magnetic field plays a strong role, Kasper said. The craft will take a roundabout, six-year route to get to the sun, looping past Venus seven times to slow down and dip ever deeper into the suns atmosphere with each pass. Throughout these encounters, the instruments will measure particles, recording their type, their temperature, their direction, and their speed. Kasper said scientists are expecting the unusual, primed by years of studying the solar wind. For example, scientists have detected that helium in the solar wind is eight times hotter than hydrogen, though they dont know why. We know from the solar wind itself that very unusual things happen, Kasper said. a pointless expensive waste. the object of study is worthy but our current technology simply isnt capable of gathering any useful amount of data before it gets destroyed by the suns fury. this project is like trying to get a closeup glimpse of god. the light will blind you and kil you so why not weight until a few hundred years until we might have the right tech. if you want to study a hot surface i think venus is still a worthy and still formideable challenge. because data on the sun's corona will probably notch us up invaluable knowledge of how an average star works, and its effects on the local planetary environment, including interactions with the earth's magnetic field. data will probably notch up invaluable knowledge of how an average star works, and its effects on the local planetary environment, including interactions with the earth's magnetic field. The "Great Reality" that surrounds and sustains us (Cosmos, Universe, God, What Is, etc) definitely has a sense of humor! Big Brother is no match for the Great Reality! Omatumr. Who is going to protect us from your BS?? Including some features shared with the pulsar core of the Crab nebula!